Forget that diamond computer for billionaires—here's the processor of the future, for the everyman. It's powered by crabs! Safe, edible, pinchy crabs. Thank you science, for this crab computer. 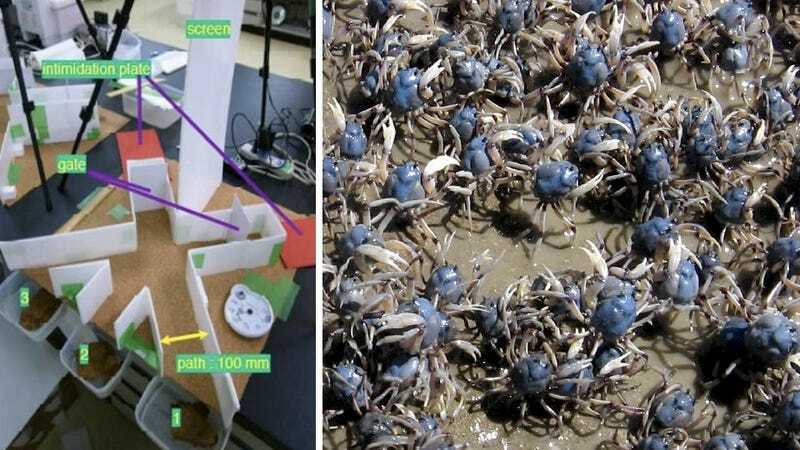 The team constructed logic gates that exploit the swarming behavior of soldier crabs. They said that "We demonstrate that swarms of soldier crabs can implement logical gates when placed in a geometrically constrained environment." The swarms of soldier crabs herded through tunnels can form the AND, OR and NOT logic gates. Logic gates are super simple building blocks of any basic computer—and now science has created them out of crabs running into each other. And how do you get crabs to run into each other? The swarms were placed at the entrances of the logic gates and encouraged to move by a shadow intended to convince the crabs that there was a predatory bird overhead.